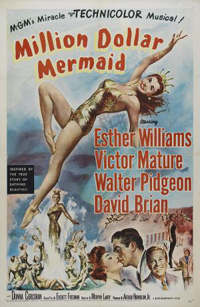 When Esther Williams passed away last week, she remained the only movie star from MGM's Golden Age who'd parlayed swimming prowess into movie musicals. Johnny Weismuller became Tarzan, but Esther Williams became America's Mermaid, the centerpiece of technicolor extravaganzas set in and around swimming pools, where Busby Berkeley choreographed elaborate water ballets involving bevvies of beauties in bathing suits. Williams did appear on land occasionally -- most notably in Take Me Out to the Ball Game opposite Gene Kelly -- but she was most famous for her water work in movies like Million Dollar Mermaid. And when her career as a professional mermaid was done, Williams became an advocate of synchronized swimming and launched a line of swim suits. To celebrate Esther Williams' unique place in Hollywood history, Turner Classic Movies is devoting 24 hours to her oeuvre, starting with 1944's Bathing Beauty at 7 pm Central time. In that one, Williams plays a swimming teacher at a girls' school whose boyfriend, played by Red Skelton, enrolls to be near her. That will be followed by Neptune's Daughter, where she is paired with Ricardo Montalban, at 9 pm Central, Million Dollar Mermaid, perhaps her most famous film, at 10:45 pm, and Dangerous When Wet, with Williams cast opposite her future husband Fernando Lamas, at 12:45. Like Williams, Lamas had been a swimming champ in his youth. Dangerous When Wet also featured a number where Williams cavorted underwater with cartoon characters Tom and Jerry. And after that, TCM is offering nine more movies, all the way through Texas Carnival, which starts at 5:30 pm Central Time on Friday. If you decide to stick around for the whole film fest, you'll get plenty of over-the-top aquatic hijinks, music and comedy from Williams and costars like Jimmy Durante, Howard Keel and Van Johnson. Check out the whole schedule here. Somebody (was it Fanny Brice?) wisecracked about her, "Wet, she's a star." And she seemed to be as aware of it as anyone, with no excessively grand ambitions for herself and a nice dry (see what I did there?) sense of humor about it, and no complaints when the stardom ran its course. She's worth remembering for a day.